This is a glimpse into the amazing life of the Solgat family in Lake County, CA.. A ma & pa ... 11 daughters...3 grandsons...2 dogs...2 cats...6 bunnies. And everyone living life one day at a time. Ali, short for Alexandra came to us a few years back. As the youngest of 11, she is quite clearly one of the highest maintenance of our crew! Some of this is just her type A ...that's A for Atomic!.. personality, some of this is due to her previous medical fragility...( she was born deaf as a result of prenalal CMV exposure...) and of course a wee bit of this high maintenance personality is due to the fact she is the baby of the family! As I learn to negotiate this blog thing, I will fill folks in on Ali at a more in depth level...for now we are just going to touch on the briefest points...Ali is deaf and through the grace of God, and the marvels of medicne ...she is a bilateral cochlear implant receipent. She has real life bionic ears! She wears Advanced Bionics' Hi Res 90k implant with Harmony processors. She adores the implants and wears them every waking moment. The way the implant works, in a VERY brief non technical way...Lol...is the internal electrode bypasses the damaged hairs in the cochlea and direct feeds the auditory nerve. The most amazing thing is the way the brain is able to take in this computer language and translate it into spoken language...Nothing short of a miracle! They come for a weekend and stay for a lifetime! As many of you know, 8 of our daughters were adopted. Louisa came to us right after we got a new puppy. Lol...I mean really, who would ever plan to get a new puppy with a new baby around? No veteran mom would ever go and get a new puppy then bring home a baby, sheesh! 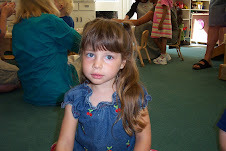 Anyhow, Louisa came to us at the ripe ol age of 5 mos..."just for the weekend..." Lol...just for the weekend has now turned into 8 years~ Louisa, age 7, is simply beautiful, both inside and out. Each of my girls are precious beyond belief...and precocious to a fault! But, I am CERTAIN they will ALL be future leaders of their world. David and I have adopted 8 daughters, birthed 3 and now we find ourselves with grandsons. ( note to editor...boys are waaay different right out of the chute...Lol ) After 11 daughters the grandsons are making sure we learn something new every day! We tend to keep busy raising our daughters (8 are still at home ) and finding time to steal for ourselves. So be sure to check back...there are plenty of adventures to be had in Solgatville! he's still the one ! Wife to David, mom to Jacqueline 26, Sarah 24, Natalie 24, Rachel 18, Jocilin 17, Sherrie 16, Jessica 14, Justine 13, Stacy 11, Louisa 7, and Ali 5.